Hello, dear stitching friends. I've come to the wise conclusion that you either LOVE April or you HATE April. I'm happy to see the snow gone, BUT the weather man is calling for 2-4 inches tonight! WHAT?? Anyway, our yard looks terrible; there is debris from the winter in all the shrubs, sticks that have been blown down over the winter, well, all in all, we look like we don't belong in this neighborhood of manicured lawns. But, MY priority is that I get plenty of daily stitching time in. Who cares if the grass is knee-high - well, actually the HOA does, but, again, whatever. If you haven't been to our website lately, you're in for a pleasant surprise. We have many new charts that were released at the Nashville Market. 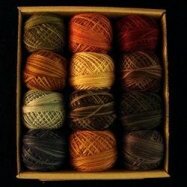 We also have new fabrics, flosses, and are now carrying the Valdani thread collections. If you aren't familiar with Valdani, they are an over dyed, hand-dyed thread that is perfect for embroidery and needle punch. One strand of 3-ply floss is equivalent to 2 strands of DMC. Here's a picture of one of the collections that we carry. The rest are on our website. Oh, they are only available as a collection. I'm not carrying individual balls or skeins at this time. I want to thank you all for being such great customers and helping us get our new business off the ground. It's been 3 months already! To celebrate, we are doing a little give-away on our FB page. Check it out to see how you can be in the running. This is the first of many give-aways, but I don't want to say too much here. I can't give away ALL my secrets. Here's my latest WIP. I love the colors even they are not traditional Christmas Colors. This is called Merry Christmas by Blackbird Designs and I'm stitching it on 30-count Old Salem line with over-dyed threads. The chart and linen are both available at our shop. Not a great picture, but hopefully, you can get the idea. And I've set quite a lofty goal for myself. I want ALL my Christmas ornaments for my tree to be stitched. OH MY! If you're going to dream, dream BIG is always my motto. I'm starting with the Hands on Designs series 'Twelve Days of Christmas'. It really is a quick stitch. Each release contains charts for 2 patterns. So I'm pretty sure I'll at least have 12 stitched! We do have this pattern in our shop also. I hope you think of us first for your needlework designs. If we don't have it, I can most certainly get it in very short time. Duty calls, orders to fill and mail.